I’m on roll here. Almost two months worth of posts again. Yay me! Seriously, yay me. It’s hard to get back into doing things after a long hiatus, and even harder when Life has been busy piling on its blessings of extra things to deal with. And of course, it’s the holiday season with its standard package of events and obligations… and memories. I don’t deal well with the holiday season. My goals aren’t suffering for this burst of motivation. I’ve managed, on average, around 800 words a day. Most of it is brain dumps and plotting ideas, but it’s been good for exploring stories and feelings reactions… New story is coming a bit slower, but I’ve managed to add around 100-300 words almost every day, just not every day. For my creativity bursts, I’ve been doing some daily drawing practice, trying out techniques and seeing what I could come up with in 10-20 minute bursts of drawing. As I used to draw from an image and then tweak to my tastes, having to free-style it has been an interesting challenge. I’m learning more about what sorts limitations I work best within and how to work around them. Limits seem to be the best creativity boosters I’ve found lately. Trying to write or draw just “anything” always seems to become nothing. But if I set a limit, a number of words or a posture… somehow I can get “something” on the page. I’ll have to start Instagraming the pictures so I can post them here as well as Facebook. And yes, the rest of my goals, to type in pages and to get packing/house-clearing done are progressing… slowly. This week’s entry for WIPpet Wednesday is 14 sentences (plus one lead-in from last week’s post) of Singer of the Swan Song. We’re still in the opening chapter., and I’m really hoping for feedback on whether this would “hook” you all as a reader. Smelly muck splashed about her as she landed face-first, just missing the paving cobbles. Her outstretched arm hit one, hard. It hurt so very much, her breath caught in her throat. The hiccups almost came. ‘Tara forced them back. She wouldn’t cry. The boys had taught her that in their games. The more she cried, the more they’d torment her. But when she’d stiffened her lip and choked back the pain, they’d petted her, telling her how strong and brave she was. Just like them. Not like the twins’ snippy sister. Her parents had sent her away because she wasn’t strong and brave. But what if… ‘Tara didn’t know if she could be more scared than she was already, but she had cried a lot the day ‘Listii’d been hurt. Was Mama sending her away now too? Interested in more? Interested in joining in? Being a WIPpeteer is pretty easy. First, you have to write something (that’s the hardest bit) and then you have to post it to your blog on Wednesday, using what we call “WIPpet Maths”… which really means, fudge around with the numbers on the date until you come up with something that fits what you’d like to share. For more WIPpet fun, head over to the WIPpet linky and visit some our other awesome members. The WIPpet is hosted by Emily Wrayburn. 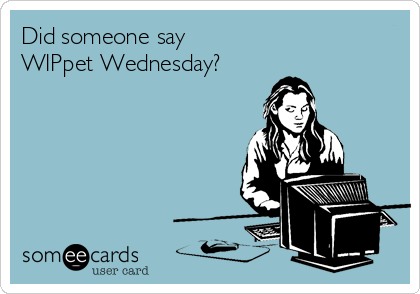 Welcome back to yet another Wednesday and another WIPpet. As usual, I have a small ROW80 check-in to share with you as well. Though I’d chosen to pare down my goals last week to help prepare for the move we have to make next Spring, this week I managed to add a flurry of new creativity growing exercises, from drawing and poetry (not fit for human consumption yet, trust me). And my word counts are doing well. Most of the writing at the moment is zero draft level. When I type things in, then the stuff gets real. Packing and cleaning is going “OK”. Not feeling inspired by this move. It needs to be done, but it’s change, and that never sets well for me, but there’s definitely a degree of mourning involved here as well. I’ve been feeling (and denying) it as best I could by staying “busy busy” since we decided his course. As the deadline encroaches on everything these days…. I’m just not there. “Quiet, girl,” Mama scolded. She extended a hand. ‘Tara reached out, happy that Mama had brought back the light. Then, from deep in the darkness behind the woman, came a loud bang. A rough, breathy whuff, like the monsters made followed, echoed and repeated from all directions beyond the archway. The last was nearer, almost to where Mama stood. Her fingertips barely touching Mama’s soft ones, ‘Tara drew back her hand hard. She couldn’t face several horned monsters in the dark, just her and Mama. ‘Listii had nearly died trying to protect her from just one of them. How could Mama and she survive so many in the dark? That’s it. Being a WIPpeteer is pretty easy. First, you have to write something (that’s the hardest bit) and then you have to post it to your blog on Wednesday, using what we call “WIPpet Maths”… which really means, fudge around with the numbers on the date until you come up with something that fits what you’d like to share. To join in, or to just read more creative entries, why not head over to the WIPpet linky. The WIPpet is hosted by Emily Wrayburn.